Unapologetically, Dr. Gonsalves questioned the basis of Eustace’s statements on the economy. “Every single year from 2001, within months of us taking office, the leader of the Opposition has been saying that the economy of St. Vincent and the Grenadines is in shambles, and the recent formulation is that it is in a mess. … I believe that when we speak to the people we must speak truthfully and with the facts. It is not that everything that the IMF reports is gospel, but he (Eustace) was quoting the IMF,” Dr. Gonsalves chided. According to the Prime Minister while the IMF report showed that the near-term outlook of the economy “appears broadly favourable”, the Opposition Leader continues to mention that the economy is in a terrible state. In fact, the Prime Minister mentioned, inflation for St. Vincent and the Grenadines for last year and for the first half of this year â according to figures from the Central Bank â are lower than any other country in the Eastern Caribbean Currency Union. 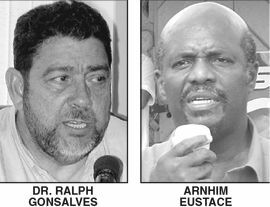 “He preaches Dooms Day, but Dooms Day is yet to arrive in St. Vincent and the Grenadines…on the critical matters I am more the Leader of the Opposition than the Opposition Leader himself, they are dealing with sideshows,” Dr. Gonsalves lashed out. administration continues to address have been scoffed at by the Opposition. “We must not allow people to stylise the facts, including those who don’t have a commitment to speak the truth on these issues,” Dr. Gonsalves cautioned.